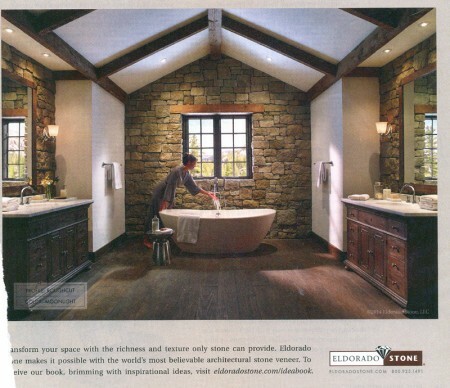 I sometimes get questions about what our castle will look like on the interior, and coincidentally I just saw an ad in a magazine that epitomized it pretty well. You could call it “mountain rustic” or ever a variation on log cabin or western styles. There are three key elements. 3. Plaster-like walls in an antique white. That is the color pallet, grey, dark brown, and antique white. This is very similar to western or log cabin styles except our wood stain is darker than those styles typically use, and instead of western motif decor we’ll have gothic or celtic style decor. What is important to understand is that I am not building a time capsule. Some people like to do that, and that is fine, but that is not my taste. I am not trying to pretend I’m living 500+ years ago, I’m trying to pretend that my house was built 500 years ago, but it has been lived in continuously, and has evolved over that time period. So on the first floor we’ll have exposed “bones” of the house where you’ll see exposed stone and wood beams and the like, but also there will be parts that look like they were done maybe in the 1920s (such as, electric lights). Public areas of the 2nd floor will be similar, but with less stone, and on the 3rd floor or above it will just be house, no specific style. Nice oak trim through out, but just regular drywall, nothing too special. In designing the house, the overall shape of the house was dictated by my desire for a castle, but the interior was nearly 100% dictated by what I though would be the most comfortable configuration for our lifestyle. I tried to envision my family living there, how we would function, and designed the house to that purpose. I located things like stairways and bathrooms at locations I thought that would be most convenient to us. So inside, the decor will have this unique old character to it, but the layout itself is very modern. Open flowing rooms, pretty much the entire 1st floor is one giant room, it is sorta bifurcated by the central staircase, into maybe two big rooms, or one giant doughnut of a room, depending on your point of view. The rooms on upper floors are also all typically larger, which is of course not typical in older houses. There will be very little “fancy” in the castle. We are not “fancy” people and we are not building a palace. No hand inlaid italian marble murals. No custom curving mahogany stairways. The flooring we want to use should look like it came right out of an old pub, very well worn. Many of the other wood elements will have rustic finishes on them. Most of our light fixtures are wrought iron. Rustic really is the key word here. In that respect we’re sticking to a more traditional castle interior, not a later manor house or palace that can be called (erroneously in my opinion) a castle. Castles were military installations, and derived their architecture and other features from their needed function, not any aesthetic desire. 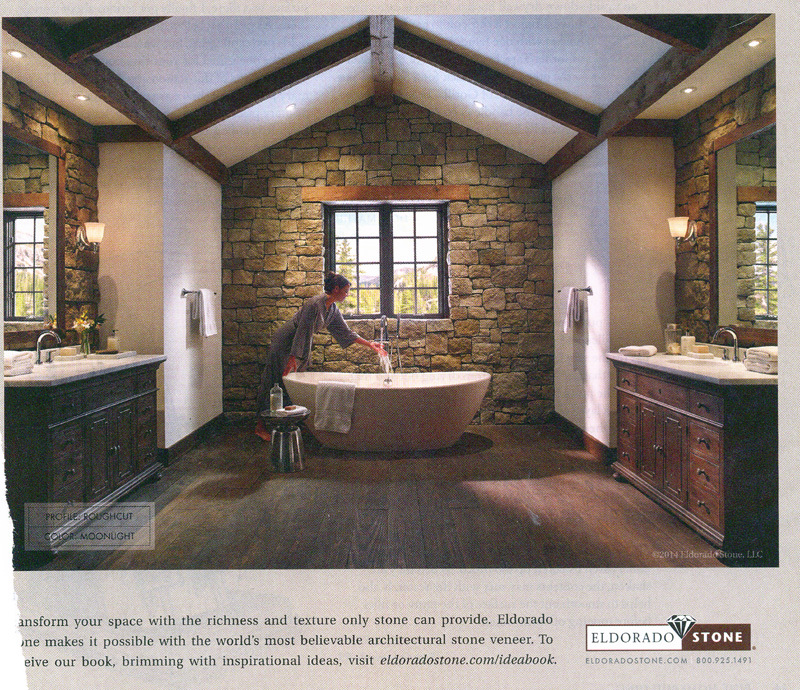 The exception will be the master bathroom because, come on, its the master bathroom. The most private room in the castle, and we’re making it fairly modern and fancy. Otherwise the only thing potentially fancy will be the stained glass in the windows, because I love stained glass. Your vision is perfect! So glad you have chosen to keep inside a more modern but rustic vibe. Your family will have a blast making all the next choices. Have you decided on a floor plan yet. I loved your original kitchen ideas. Loved the copper hammered sink!! Thanks for up dates! This is the part I am most interested in. I have a very similar approach (again – very early in planning/dreaming stage). I generally do not like the highly decorative styles of renaissance era castles and certainly want to avoid the ornate and highly detailed feel of many palace-like estates. I agree that rustic is a way to describe it and I have always struggled on how to describe it to people that immediately think I mean a western hunting lodge with crowded decorations and rooms. I sometimes refer to it as a rustic-minimalist style. Anyway – Very much looking forward to seeing what you post on this topic. 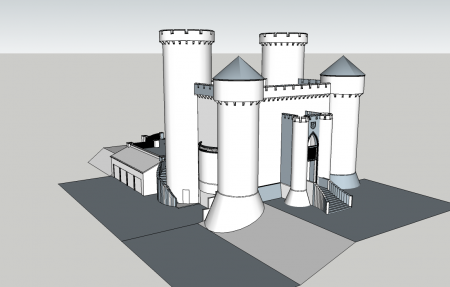 I plan to keep all levels of the castle on a very similar feel – maintaining a lot of exposed stone work and wooden beams. But in doing so, I’ve also needed to factor in thicker walls that taper as you go higher up in order to support the heavy structure on 3rd and 4th levels. Best of luck! I’m still very interested in following along and sincerely appreciate you sharing this online. Thanks again!